Former President of the Republic of Ghana, the Late J.E.A. Mills, swears on the Bible to take office. NTOABOMA — No place makes better Akpeteshie than Ntoaboma. This is actually true. No one brewed this hard liquor better than my grandmother. This is also true. Still, these truths don’t mean my grandmother never ran into any problems. As my grandmother’s operations increased in volume, there was a need to seriously consider alternative ways of storing and transporting Akpeteshie from Ntoaboma. Storing hard liquor is a tricky business. Whether it’s still sealed or already opened, there’s no need to refrigerate or freeze liquor. Hard liquors like Akpeteshie, a rum, are perfectly safe to store at room temperature. Therein lies the problem of storing spirits in large volumes: What is room temperature? At higher temperatures — although our storage facility was roofed with thatch to keep it as cool as possible, and built with wood and brick in typical Atakpame style to keep the inside dry and coolly regulated – we lost a sizeable volume of rum to evaporation, no matter how well we sealed the containers. Now, my grandmother understood that this was a typical physiochemical problem. The solutions of which required (1) using a better seal and (2) regulating the temperature within the storage facility. Better drums for storage, with better seals, would have been nice. But that option was largely unavailable. To purchase such a product would drive up costs considerably. Therefore, temperature was the only fixable culprit. That’s when my Aunty spoke out: We need an Air Conditioner to regulate the temperature. “How?” my grandmother asked. “We can fix the temperature at 23 Celsius.” That is on average the room temperature we get most seasons. In the rainy season however, the temperature in the storage house can drop to a good 19 Celsius. “How much?” my grandmother retorted. “Did Jesus Christ tell you that?” We all laughed. Of course, this is a common retort of my grandparents. Anytime none of us made any sense, we heard, “Did Jesus Christ tell you that?” It was a fancy joke my grandparents held dear to check the most common language they had come to associate with Mission School Education and Evangelical Christianity in Ntoaboma and around. The pastors and Christians from these institutions always recounted Biblical stories to my grandparents, as if they were handing down pertinent information to solve Ntoaboma’s daily problems. Most evangelical pastors believed God, or Jesus Christ, spoke directly to them – or inspired them with solutions to human problems. Certainly, most of those solutions laid in the Bible; they would claim. Asking “Did Jesus Christ tell you that?” was my grandparents’ way of ascertaining if a suggested solution was actually feasible and sensible or if it was a message from Jesus Christ. My Aunty was certainly flushed, quickly realizing that my grandmother was seriously pondering over a physiochemical problem: If the temperature of the storage house reached 27 Celsius, can we reasonably cool it back to, say, 23 Celsius and salvage what we lost, or at the very least save money – and halt further evaporation of our fine Ntoaboma Akpeteshie? More, my grandmother was interested in the solution to this problem: Can we reasonably cool it back to 23 Celsius and recover what was lost? Now, imagine that my grandmother took the hit and bought a fully sealed drum to store Akpeteshie. This new system would consist of nothing else but Akpeteshie, some air (you cannot discount this) and some water (no distillate is ever 100 percent alcohol). Brewing Akpeteshie is a stubborn business. The highest proof Akpeteshie you can buy is Ntoaboma Akpeteshie, at 190 proof, the Devil’s Cut. Alcohol proof in Ntoaboma is defined as twice the percentage of alcohol by volume. Consequently, 100-proof Akpeteshie contains 50 percent alcohol by volume; the rest is water (if you buy it from a real source, else you will never know!). “190-proof? That’s nothing,” you might believe. “Let’s get together and make Akpeteshie at 200 proof.” Except you can’t do that. There’s a physical limit to how pure alcohol can get. Always confirm that your Akpeteshie is a sealed product of Ntoaboma. You probably get the picture when I say that the best Akpeteshie comes from Ntoaboma. And that my grandmother makes the best Ntoaboma Akpeteshie. Anyway. Imagine that my grandmother bought the sealed barrels to store the Akpeteshie. The mixture here roughly includes some air and some water. We must as well assume that the mixture is completely isolated from everything else, up to and including the source of heat in the Atakpame storage house. That is, if the temperature in the Atakpame house rises, we can only safely expect that the temperature within this barrel “magically” rises by the same amount although we intend to discount the transfer of heat from outside the barrel to the Akpeteshie. How convenient, you say. Well, physiochemistry is crazy in this strange regard – you must make such interesting assumptions or else you will get nowhere. There’s a somewhat reasonable explanation for this, but it is safely situated beyond the scope of the story about my grandmother. At this juncture, my Aunty and I resolved to tackle the problem head-on. We reasoned that the only characteristics of the system that should enter into the discussion were the thermodynamic variables: the number of components of the system (Akpeteshie, water and air), the phases or types of aggregation in which the components occurred (water for example occurs in the liquid, solid and gaseous phases), the concentrations of the components in each phase, the temperature of the mixture inside the barrel and the pressure on the walls of the barrel. We knew the basic theory that for a given temperature and pressure, each component in the system will occur in its various phases with definite concentrations, and conversely. Thus, if the temperature of the Atakpame storage house falls, and consequently that of the barrel falls in suit, the concentration of water in the gaseous phase reduces, but its concentration in the liquid phase increases assuming that the same pressure remains without change throughout. The variables of the system thus stand to each other in definite relations of interdependence, so that the value of one variable at any given time may be “determined” by the values of the other variables at that time. Now we supposed that at some initial time the system was in a definite “state” of 23 Celsius (i.e. the variables have certain initial values) and that because of some change induced in one or more of the variables at that time, the system was in some other definite state of 27 Celsius after an interval of time; but we also imagined that the system was brought back to 23 Celsius in some way to its initial state, that exactly the same changes are induced in the variables as before, and that after this same time interval, the system was again in this initial state. My Aunty reckoned that if the “states” within the Akpeteshie system behaved in this manner, no matter what state it took to be the initial state and no matter how large the interval of time had elapsed, the system would be “deterministic” with respect to the specified set of thermodynamical variables. Indeed that was the only conclusion we could make. We built a few cans and tried out the experiment of Akpeteshie mixtures as best as we could. It was the only time Grandmother would allow us to play with Ntoaboma Akpeteshie, especially the Devil’s Cut—and I admit to getting drunk a few times on the job. While it was an enjoyable experience, we soon realized, no doubt, that experimental science turned out to be all the science there was. The rest is gibberish – fancy, and short. My grandmother refused to invest in an Air Conditioner because we couldn’t answer her question. There was no theoretical framework for determining the answer to her query. It had to come from experimentation. She could not conclude with any certainty whether or not the Akpeteshie system was “deterministic.” No one could report for sure that the system that is the Akpeteshie barrel was a deterministic one – that by dropping the temperature from 27 to 23 Celsius, the same changes induced in the barrel on its way up the Celsius scale would be induced on its way down however long it took. My grandmother’s storage problem was never solved. Whenever any smart mouth – customers, clients, friends, children, etc. – felt an Air Conditioner might solve her evaporation problem at the Atakpame storage facility, my grandmother always jibed, “Did Jesus Christ tell you that?” For those of us who were familiar with the pun, we laughed. Others found it a bit uncomfortable. My Christian friends once threatened to never visit my family home again. But my grandmother played this game with fanfare. The Biblical stories of Christ, Solomon, David, Joseph and in particular Job had come to dominate almost every scholarly discussion in Ntoaboma. Quite literally the Mission Schools and the Evangelical Church had come to influence what stories were served with dinner in Ntoaboma. Job’s story – of a man once wealthy, then tried and tested by God with poverty, who because of his never-flinching belief became immensely rewarded by God – had been told to so many children in Ntoaboma over and over. Pastors in Ntoaboma used Biblical stories to “diagnose” and “cure” various ailments of their followers. Be it cholera, malaria, depression, back pain, stomachache or broken foot, these pastors had the strange ability to find an equally compelling story in the Bible to justify their prescription for a cure. This “magical” behavior always stoked my grandmother’s interest. “If there are no physiochemical theories to determine what happens in an Akpeteshie barrel, how are there so many answers about every single ailment in a tiny book?” Usually she would ask in all kindness, but with a smirk. If the reference to the physiochemical problem my grandmother posed is carefully examined, it becomes clear that what these pastors and spiritual leaders at Church engaged in was a kind of historical “determinism.” According to their thesis, for every set of attributes (or variables) of an ailment, there was a story (a system) in the Bible, which was deterministic with respect to that set. 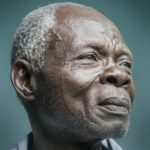 When Jaduke lost his molasses extraction job in Ntoaboma, I remember the pastor turning to the book of Job to explain away his pain and depression – that it was an act of God. If Job was tried and tested by God some thousands of years ago, God would be the one trying and testing Jaduke now. No matter how much time had elapsed since Jaduke was without work, his pastor maintained the same story. My grandmother always wondered why the pastors were able to determine what would happen to someone like Jaduke but couldn’t figure out whether or not she needed an Air Conditioner. According to this Biblical “determinism,” for every set of human actions, individuals or collective characteristics such as ailments or social changes, that may be of concern to the Christians, there were stories (systems) in the Bible, which were deterministic with respect to those items – where the state variables of the system existed, however unspecified. ‘God is our provider,’ or so goes the popular belief among the religious, and even among the spiritual. But for many followers of Christ today ‘God is the solution,’ is the ultimate expression of that awareness. In this essay, Narmer Amenuti questions not only the basis for such an omnipresent belief among worshippers of Christ, but also questions the use of Biblical anecdotes as basis for the construction of solutions to new problems – determinism. This sort of theology or philosophy, where the Bible provides insights to new problems, has found its way even into the higher offices of our lands. 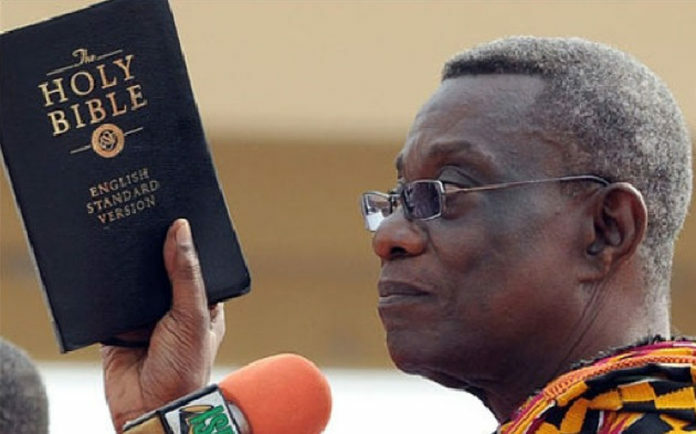 Ghana’s former president, the late John Evans Fiifi Atta Mills, was reported to have used his judgement from the Bible to ban the pouring of libation (an ancient African prayer ritual) from state functions. So profound then are the effects of such philosophies, especially by public officials, on the lives of Ghanaians, and Africans in general, that the subject warrants nothing but as classy a treatment as this one. With his ritzy approach, Narmer steps towards revealing the problem that is religious determinism, from its religious (Christian) fulcrum, and explores how it plagues our country from the confines of an Akpeteshie distillery up to and including the highest office in the land, the president. This is Deep! The weaving of chemistry, mechanistic determinism which plagued European science for centuries and religious philosophy is quite astute. Not everything has a solution in the Bible. The general theories (deterministic theories) in the Bible for inspiration must be carefully examined. “Carefully examined” in much the same way as our friend Atiga Jonas Atingdui did on his last article about Quantum Mechanics and the Black God at the center of the Abrahamic religions. Without scientific explanations of ancient texts, one cannot rely on them for decision making. History is important. But the correct history is vital. Through adequate thought, through logic, through science, we may be able to even recover the meanings behind some of our ancient texts if not all. But Narmer Amenuti has truly inspired me with his simple explanations of what sometimes look complex in science. I like this article soo much not because it better than any article the writer has ever produced herein but it really explain the reason of Africa retrogression in economic advancement than any political economic book read ever. And this is how I captured it..
Any moment a society abandon a rational thinking and settle on historic determinism format to predict the current and the future, as an easier way to life…. the result will be a defeat to life against the thinking and action mind. Make your empirical studies of a socio-economic environment dominated by weak mind who settle for historical determinism; it always occupied with hypocrisy and blame game, with only few smart plundering the system to their advantage. If most of women who form majority of our population will raise the bar of rational thinking, this men of confidence tricksters will wake up and seek for serious business to do, that will automatically transform Ghana within just a month back to a full prosperity world. Excellent article my good friend Narmer Amenuti! Your clear understanding of physics and mathematics are truly interesting to read. Your connection with our folklore is refreshing. Determinism is a very limiting game played by scientists, knowingly and unknowingly. The ones who know understand the basis and limitations of their predictions. It’s the ones who don’t know. They are the dangerous ones. If Mills was left long enough as president of Ghana, you bet if the Americans came to him and asked that he defund Dondology, teaching and learning African languages, he would actually have done it. Its’ pathetic.